In this one simple pie graph, which was provided by Josephine County, you can see all there is to know about why the new tax initiative proposed by the Association of Oregon Counties (AOC) and demands by Oregon’s U.S. Attorney Billy Williams for us to spend more on diversion, are absurd. 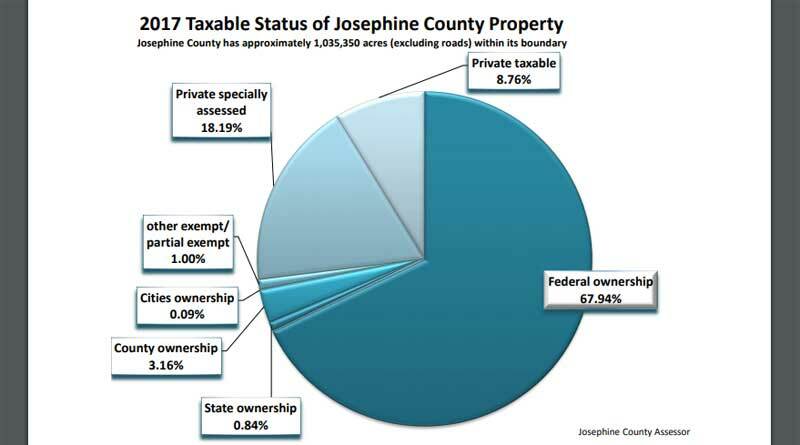 The federal government claims ownership or control of 67.94% of Josephine County. Only 8.76% is fully taxed at the private rate, with an additional 18.19% specially assessed (private forest lands, primarily). We can’t tax, or enact law enforcement, on over two thirds of our county that the federal government owns or controls. Another 4.09% is owned by other municipal governments, and are also untaxable for that reason. We have full access to, and the ability to tax, less than 9% of “our” land, while government controls over 70% of the county. Williams’ office already has a very large budget—one that was recently made bigger with a deposit of $1.2 million from federal seizures in Oregon due to alleged diversion. Oregon cannot enforce federal law or enact law enforcement on federal land. We, as a state, only control and are able to enforce the law in less than 30% of our county. We tax less than 30% of our county. It is the job of the OLCC to inspect and enforce all of the registered grow sites, including OMMP sites. They already have a budget for this. It is the job of the OSP to enforce state laws—not federal laws—on our public roads. They already have a budget for this. It is the job of city police to enforce city laws in city limits. They already have a budget for this. 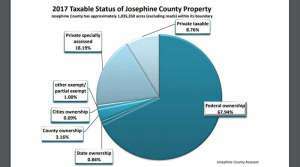 Over 250 OLCC licensees are already pouring over a million dollars into OLCC licensing—in Josephine county alone—this year. Approximately 3000 growers poured over $3 million in fees into OMMP coffers last year for grow site registrations alone. Legal, regulated growers in this poorest of Oregon counties—with five of the six poorest zip codes in the state—have paid over $4 million to the state, just this year, to enact these programs, which provide no customer service or support to the people who pay them. Patient registration alone in Josephine county last year brought in another roughly $1 million to the OMMP. I am perfectly aware that portions of this money are dedicated to expenditures other than law enforcement, but we haven’t even begun to discuss how much tax money was collected and distributed based on total number of registered grow sites and retail sales. And although government waste, largesse, and monetary diversion are not the specific focus of this conversation, they cannot be left out of the discussion entirely. 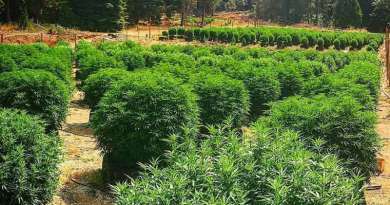 Of the 90,714 acres eligible for full taxation in this county, less than 750 acres are conceivably being used to cultivate legal, regulated cannabis. That’s about a one square mile of total land surface area out of 6740 square miles. Diversion, as a problem, is another topic. 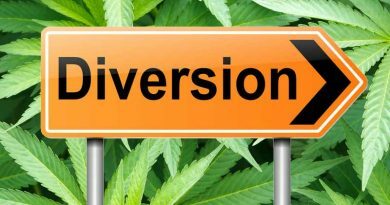 Diversion is created by the federal classification of marijuana as a Schedule I drug, not by states with cannabis-positive laws. This status was based on lies (John Ehrlichman) and racism (Harry Anslinger), was enacted against the recommendations of the committee tasked with making the decision (Shafer Commission), is still widely unpopular (Pew Research), and its underpinnings were ruled illegal (Leary vs. US,- Supreme Court). Arguably, the federal government maintaining Schedule I status for this plant is a violation of several Constitutional amendments, and a basic violation of Article 1 Section 8 of the US Constitution. The federal government is failing in its basic duty to protect and secure our borders and provide for our “general welfare,” as clearly demonstrated by the heroin and meth that are coming in to our great state from Mexico. Regardless of an individual opinion on cannabis in society, you will not find a single fact-based argument that places cannabis on the same level of social harm as the drugs that the US government is failing to keep from entering our fair state. California, Nevada, and Arizona share borders and regulatory structures that are very similar and which can and should allow for interstate commerce. 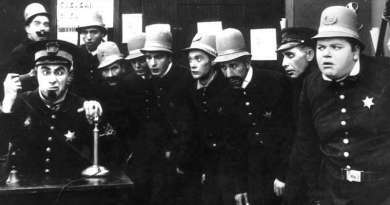 Marijuana diversion and the need for more law enforcement to prevent it are specious arguments at best. In a land rife with opportunity and flush with money, this conversation is spurious. It’s time for those in the conversation to acknowledge this and move on to solving real problems.